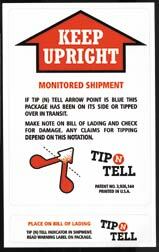 A two label system for monitoring your shipments is available for impact and shock indicating and tipping or tilting indicating. One damage indicator label is affixed to your pallet or shipping container explaining the function of the damage indicator. The second warning label is affixed to the bill of lading to alert the carrier and consignee that the shipment has been monitored. 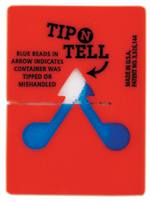 With the Tip n Tell if the blue beard in the arrow will indicate if the load has been overturned or tip. The Impact or Shock indicators will have the arrows turn to blue if the impact exceeds the g force of the indicator.